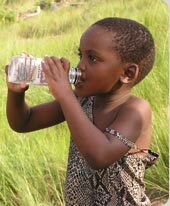 Water that is available to people in Africa is not always safe to drink. Natural water supplies are often polluted and contaminated with sewage or waste-water. And even municipal water supplies in towns and cities can contain unhealthy levels of microbes or chemicals. QuaWater offers reliable products that improve the quality of water for villages, homes and businesses. These products are based on proven technologies with strong scientific backing. Absolute focus on quality and customer satisfaction has been key to QuaWater's success. Enjoy safe and healthy drinking water for you and your family! Considering that you drink around 2 litres of water every day, do you really want to rely on the quality of your tap water? The QuaWater AquaDoc UV provides you and your family with the peace of mind that the water you are using is safe and of good quality! 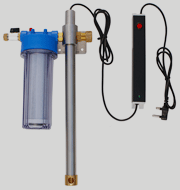 Order replacement lamps or filter cartridges for your AquaDoc UV. We believe safe and affordable drinking water for rural populations in Africa can be achieved! All over Africa we are working hard on projects that provide villages with comprehensive and durable water solutions. Find out more about how the QuaWater Village Solution contributes to safe drinking water and better health! View Village Solution projects completed to date.